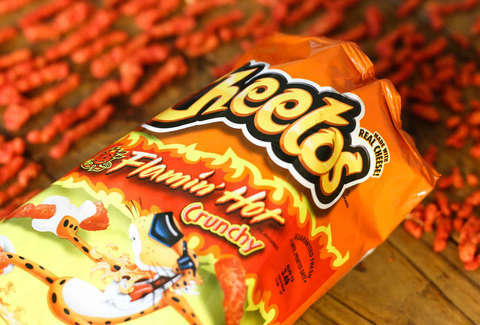 Can Flamin' Hot Cheetos Really Send You to the Hospital? Earlier this week, meme victim, yung rapper, and pretty accurate version of what Oscar the Grouch would look like as a human, Lil Xan, went to the hospital. On his Instagram, he assured his fans that the medical emergency was "...not due to any drugs, but I guess I ate too many hot Cheetos, and it ripped something in my stomach open, so I puked a little blood." He seemed to be in good spirits, despite his hospitalization, and pretty much dropped the topic all together -- but not before reminding his fans that "Hot Cheetos are one hell of a drug." But as someone who has, admittedly, consumed a Flamin' Hot Cheeto in my time on this Earth, I had questions, and concerns. While I certainly trust Lil Xan's words in matters of politics, philosophy, and prescription medication, I was a little wary of his claim that Flamin' Hot Cheetos actually tore his stomach apart. After all, I have a stomach that I pretty much depend on not being torn apart on a daily basis. Was this a cover-up? Like when celebrities go get nose jobs under the guise of appendicitis? Can Flamin' Hot Cheetos live up to its hyperbolic name, and actually... hurt you? Fans of Lil Xan and overconsumption (which I have to assume have a fairly high correlation) might not like the answer. Aside from Lil Xan's lil incident, the biggest blip on the "Hot Cheetos Will Lead to Hospitalization" radar happened way back in 2012, on the precipice of FHC's popularity. But, it was really a case of food coloring-fueled misunderstanding, as many parents were taking their kids to the hospital after discovering (what they thought) was blood in their stool and/or vomit. It was just flamin' hot dust staining the bodily fluids of our children. No big deal! Aside from that, it does seem pretty clear that the level of spice present in snacks like Flamin' Hot Cheetos can exacerbate stomach issues, and even cause some slight levels of discomfort in those without preexisting stomach issues. But this could pretty much pertain to almost any spicy food. "Flamin’ Hot Cheetos and similar snacks can cause stomach irritation and damage in some individuals so it’s definitely possible that they affected Lil Xan. These are not great snacks with its simple carbs and artificial ingredients. It’s really high in calories as well. So, have Flamin' Hot Cheetos once in a while but don’t make it a habit." This pretty much corroborates with what the internet -- and my intuition, which is basically the internet of my soul -- has told me. Either Mr. Xan was eating way, way too many Flamin' Hot Cheetos (like hundreds per day), or, he had a preexisting stomach condition that was severely bothered by the spices. So the moral of the story is the same moral of so many viral, food-based internet tales of modern times: Ridiculous food is usually OK, in moderation. Just pace yourself, kids. And if anything, let Lil Xan serve as a example of both how to live, and how not to live, simultaneously.